Jesus’ Nephite disciples were “united in mighty prayer and fasting,” desiring to know the name they should use for his church (3 Nephi 27:1–3). He taught them that His Church was to be called after his own name (3 Nephi 27:4–9). His restored Church in our own day is also to be called after his name (D&C 115:4). To be “His Church” a church must also be based upon His gospel (3 Nephi 27:10–12). Aspects of the gospel of Jesus Christ, as defined by the Savior, include: (3 Nephi 27:13–20). —Jesus’ submission to the will of the Father (v.13). —Faith in Jesus Christ (v.19). —The gift of the Holy Ghost (v. 20). —Enduring to the end (vv.16–17, 19). As the head of His Church, Christ is our Exemplar: “What manner of men ought ye to be? Even as I am” (3 Nephi 27:21–22, 27). They were Apostles unto their people (1 Nephi 12:8–9). About 600 years earlier, an angel who showed them to Nephi in vision called them “the twelve disciples of the Lamb” (v. 8). They will judge the descendants of Lehi (3 Nephi 27:27). Jesus promised that whatever they asked in his name would be given them (3 Nephi 27:28–29). “My joy is full” (3 Nephi 27:30–32). Nothing brings greater joy to the Savior than when one of us is saved, because He paid the ultimate price for each person’s salvation. “Enter ye in at the strait gate” (3 Nephi 27:33). The gate to eternal life is “strait” (restricted) and “narrow is the way that leads to life, and few there be that find it. . .” Nevertheless, God loves us and will do everything He can to save His children. In the end, the scripture says, “few” will find their way to exaltation. But does this mean “only a few” or does it mean “few, in comparison to those who do not.” There is a difference. Our Father has billions of children, and if only 10% of them were exalted, that would still number in the billions. Before the Savior left his disciples, he asked them what each desired of him (3 Nephi 28:1). Nine of them asked that after they had lived to old age that their ministries “may have an end, that we may come unto thee in thy kingdom” (3 Nephi 28:2–3). The three others did not dare ask, but the Lord knew that they wanted to remain on earth until his return so they could continue to bring souls unto Christ (3 Nephi 28:7–9). —They will never endure the pains of death (v. 8). —At the 2nd Coming they will be changed in the twinkling of an eye to immortality (v. 8). —They will be “blessed in the kingdom of my Father” (exalted) (v. 8). —They will not have pain while they shall dwell in the flesh (v. 9). —They will also not experience sorrow except “for the sins of the world” (v. 9). —They will continue to “bring. . .souls. . .unto me” while the world stands (v. 9). —The three Nephites became translated beings. Moses, Elijah, John the Revelator, and the three Nephite disciples were translated so that they could remain on earth to perform special labors. —They were cast into prison, but the prisons could not hold them (v. 19). —They were cast into the depths of the earth, but the earth could not hold them (v. 20). —They were thrown into a furnace three times but were not harmed (v. 21). —They were twice cast into a den of wild beasts, but they played with the beasts and were not hurt (v. 22). Mormon, as he abridged the Nephite record, was about to write the names of the three but was stopped by the Spirit (v. 25). But Mormon testified that he had seen these three Nephites and they had ministered unto him (v. 26). —They will be among the Gentiles, who will not know who they are (v. 27). —They will be among the Jews, who will also not know who they are (v. 28). —They will eventually minister to all of the scattered tribes of Israel (v. 29). —They will minister unto all nations, kindreds, tongues and people (v. 29). —Like angels, they can show themselves to whomever they choose (v. 30). —”Great and marvelous works shall be wrought by them” (v. 31). —A change would take place in their bodies so they would not die (v. 37). —They would feel no pain or sorrow except for the sins of the world (v. 38). —Satan could have no power over them (v. 39). —They could not be tempted (v. 39). —They had become sanctified and holy (v. 39). —The powers of the earth could not hold them (v. 39). At this point, the Lord apparently ascended into heaven for a final time and was not seen generally among the people again. 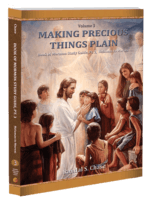 Reflecting on the marvelous account of His visit to the Nephites, Mormon offers a summary of key events and doctrines that resulted from the Savior’s visit. The restoration of scattered Israel will begin when the Book of Mormon comes forth to the Gentiles (3 Nephi 29:1–7). The Lord counseled us not to let prejudice affect our thinking or actions toward any people (3 Nephi 29:8–9). To “make game of Israel” (v. 8) refers to making fun of (humiliating) them. Mormon urged the Gentiles to repent, to put away wickedness, and accept the gospel (3 Nephi 30:1–2). —4 Nephi covers 285 years—almost 1/3 of all the years covered in the entire Book of Mormon. —4 Nephi contains Mormon’s abridgment of about 300 years of history. —Those 300 years are condensed into four pages—a single chapter of 49 verses. —The original history from which he abridged 4 Nephi was written by four men: Nephi, who was one of the Savior’s twelve Nephite disciples; Nephi’s son Amos; and Amos’s sons Amos and Ammaron. When the Book of Mormon was first printed, 3 and 4 Nephi were each called Book of Nephi. In 1879 Elder Orson Pratt, authorized to prepare a new edition of the Book of Mormon for the Church, added Third and Fourth to the two books in order to help distinguish one from the other. In only three years, all the people were converted to the Lord (4 Nephi 1:1–5). Nephites and Lamanites united in the church of God and “had all things common” (v. 2). Not every Nephite and Lamanite had seen Christ while he was in America. After 25 years they were still happy living the gospel—following Christ’s teachings (4 Nephi 1:7–11). After 70 years, they were still a Zion people (4 Nephi 1:12–13). There was no contention among the people and miracles were still wrought among the disciples of Jesus” (v. 13). After 100 years, only the three translated disciples remained from those who had seen the Lord (4 Nephi 1:14). The other disciples of Christ had all gone to the paradise of God. After 100 years, they were still a Zion people (4 Nephi 1:15–17). Those who now lived in that land were the children and grandchildren of those who had seen the Lord. 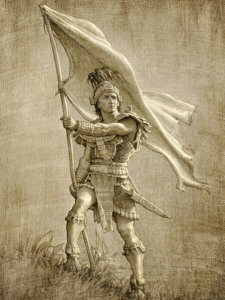 What is a “Nephite” or a “Lamanite” by this time? (4 Nephi 1:17, 20). The word “Lamanite” is defined to mean those who had apostatized from the truth (v. 20). It had nothing to do with whether they were descendants of Laman and Lemuel. There was never a happier people in the earth’s history, according to Mormon (4 Nephi 1:16, 18). The records were passed down through righteous men through three generations (4 Nephi 1:19, 21). After 195 years, a small number of people apostatized from the Church (4 Nephi 1:20). After 200 years, they were a Zion people no more (4 Nephi 1:22–25). They had become very numerous, has prospered, and became prideful—no longer having all things in common among them. False churches arose, denying the Christ and His gospel (4 Nephi 1:26–29). They divided into classes and accepted all kinds of wickedness, even in their churches. A similar decline in our own day. We are witnessing today the very same “secularization” of Christianity, with churches going out of their way to condone wickedness that they once condemned. In the name of “tolerance,” they “call evil good, and good evil” in order to attract adherents and become acceptable to the world. And as a result, our society is experiencing a rapid decline into lasciviousness and error. No doubt, this is the very reason that Mormon included these steps toward destruction that the Nephites experienced after three generations of peace. A similar decline will occur in the Millennium. One might think that the Millennium will feature worldwide acceptance of Christ and His gospel, with no wickedness to be found for 1,000 years. But this is not the case. Satan will be bound by the righteousness of the people (1 Nephi 22:26). But the Lord warned, “When the thousand years are ended and men again begin to deny their God, then will I spare the earth but for a little season” (D&C 29:22). This means that toward the end of the Millennium, righteousness will descend into wickedness, just as it did for the Nephites, and the world will be made ripe for its final destructive cleansing. The Nephites declined rapidly after 200 A.D—The 4th generation (4 Nephi 1:25–44). —Churches that professed to know Christ but denied most of His gospel (vv. 26–29, 34). —Churches built up to help people get gain (vv. 26–29, 41). —Persecution of Christ’s followers (vv. 29–34). —Parents teaching children not to believe in Christ (v. 38). —Parents teaching children to hate (v. 39). —Secret combinations set up to get power and gain (vv. 42, 46). —As a result of these developments, we are told that the three Nephite disciples began “to sorrow for the sins of the people” (v. 44). After 300 years, the entire society became wicked (4 Nephi 1:45–46). Gadianton terrorists “spread over all the face of the land” and “there were none that were righteous save it were the disciples of Jesus” (v. 46). The records were placed in the hands of Ammaron, who buried them in the earth (4 Nephi 1:47–49). His intention was to protect them “that they might come again unto the remnant of the house of Jacob” (v. 49). And with that notation, the record that had been kept for 1,000 years on the large plates of Nephi came to an end. Everything else that we have available to us in the Book of Mormon came from the personal writings of Mormon and Moroni, and from the record of the Jaredites. 1. Doctrines of Salvation, comp. Elder Bruce R. McConkie, 3 vols. [1954–56], 3:319–320. 2. Ensign, November 1996, 53. 3. The Millennial Messiah: The Second Coming of the Son of Man , 695.